Brian Stratton was appointed Director of the New York State Canal Corporation in April 2011, to oversee the operation and development of New York's 524-mile Canal System, including the historic Erie Canal. He was appointed at the recommendation of Governor Andrew M. Cuomo, and serves as a member of the Governor's Cabinet. Prior to joining the Canal Corporation Mr. Stratton was elected Mayor of the City of Schenectady on November 7, 2003, and re-elected to a second term in 2007. During his tenure, Mayor Stratton successfully identified and corrected the City's serious inherited financial problems, returning Schenectady's municipal credit rating from the lowest in New York State to investment grade, including a sustained A- rating by Standard & Poor's. During his seven years as mayor, he worked with local leaders to attract more than $300 million in new private investment in the City of Schenectady, creating and retaining more than 2,000 jobs. As Mayor, Mr. Stratton also served from 2009-2011 as Co-Chair of the United States Conference of Mayors Water Council, leading mayors of more than 300 American cities in the discussion and national policy formation of issues impacting how cities provide safe and affordable water and wastewater services. 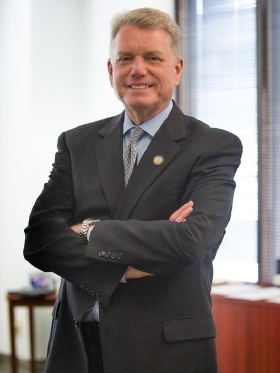 His numerous awards include the National Association of Government Accountants (AGA) Distinguished Local Government Leadership Award in 2009 and the AGA New York Chapter Outstanding Achievement Award in 2008. Mr. Stratton received his Bachelor of Arts Degree from SUNY Oswego in 1980.